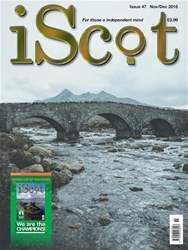 Digital Subscriptions > iScot Magazine > November/December 2018 > A Welcome Tae Edinburgh! As the Festival crowded Edinburgh, on the 24th August 2018, we welcomed some special visitors to our capital city. iScot went along to meet two of the brave men who founded and run a highly successful anti-poaching initiative which now has links with organisations all over the world, including WWF. Chengeta Wildlife, who have developed a unique and highly successful anti-poaching strategy along with intensive programmes to train rangers in these techniques, have made huge inroads into the ivory poaching trade in Africa which has brought the elephant populations to the brink of extinction. On their first visit to Scotland to raise much-needed funds and to raise awareness of the complex issues involved in prevention of ivory poaching were Rory Young, founder and director, and Nigel Kuhn, chief trainer of the Chengeta Wildlife rangers as well as being a successful professional photographer and film maker in his own right.